25% of migrants in Austria work below their educational level. Women are even more affected. Due to the lack of recognition of their qualifications they experience dequalification. Unused ressources are likely to complicate their social participation. And additionally this is not beneficiary to the economic system and employment situation. “Recognition! – Project for an easier recognition of international/foreign qualifications” continues in 2015 to reduce structural barriers for a successful recognition of qualifications. Our main local focus lies on Styria with certain services also offered all over Austria. Our approved recognition-services are workshops and professional inputs offering compact know-how as well as practically-oriented awareness-raising and public relations activities. We focus on multipliers and companies (especially SMEs). We also develop indicators for structural improvements (f.e. the Austrian law on recognition). Event: How Recognition may succeed! 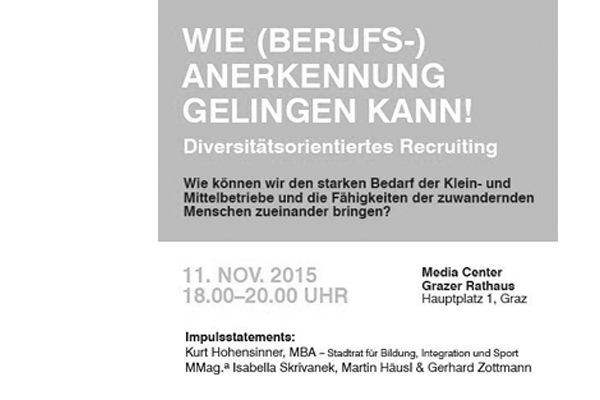 On November the 11th 2015 we invited to an information event at the MediaCenter at the City Hall in Graz on the topic of diversity oriented recruiting. The city councellor for integration and education Mr. Kurt Hohensinner, MBA started the event referring to the international political situation and the following necessity of migration and recognition of international qualifications. The key-note speaker MMag.a Isabella Skrivanek (Donau-Universität Krems) gave a scientific overview on the complex Austrian situation with an outlook of wishes for simplification to foster economic positive effects by a better integration into the labour market. The head of the Styrian integration centre Mr. Martin Häusl reported on programmes like “mentoring for migrants that brings qualified and highly qualified mentees together with mentors form the economic sector. The entrenpreneur Gerhard Zottmann gave a portray of an every day routine covering all steps form the application to the career that happen in a company employing an international team with different qualifications and certificates. He also talked about necessary and useful support services for SMEs. Afterwards several questions concerning recognition were answered and some suggestions for solutions were discussed.